Download PDF Copy, click HERE. Many people had the impression that the higher the wattage, the better it is. You get more power for the same price? Answer is NO. Power in this case is not what you think as the more powerful it is the better. On the contrary, this is a measure of the power consumption and not the power output. You are getting the same brightness but they consumes different power. For the same brightness, the lower the power, the better it is. Compare a Kilosaver LED Tube of 15W with a Retail Version of 20W, you saves 5W. If you leave the light on for 24 hours a day, that 5W of savings translate to approximately $10 extra savings per year. Money savings aside, higher wattage means more heat. If your room is air-conditioned, 5W of additional heat will require 20W of additional cooling energy and that will add $400 a year into your energy bill. If you have 20 tubes, you burnt $8000 per year. Furthermore, LED is very heat sensitive. The efficiency drops with temperature. More heat means you will get less light, so you may need more tubes and that's extra expenses. Moreover, more heat means the LED lifespan will be shortened. That means you got to replace the tubes more frequently. By the way, good quality LED used in Kilosaver are sold by the LED manufacturer at a per piece cost. So they are expensive but still half the cost of high-end LED. The brightness is guaranteed for it's lifespan. Retail Versions of LED are sold in bulk sometimes sold in Kg. Most are used for decorative LED and are expected to be disposed off after the festival. Some unscrupulous vendors use these LED so as to make a higher margin and selling cheap tubes to the masses. These are meant for the local China market and need to be replaced frequently. On the contrary, Singapore labour is expensive. The High-end version will save more but the cost savings against Kilosaver will take about 3 years to recover. However, if you switch on for only 4 hours a day, it may take 18 years to breakeven. Therefore, the high-end version is normally used where it will be switch on for 24 hours. Nevertheless, LED light efficiency is constantly improving and a 6W version may produce the same brightness and cheaper too. Weighing against future cheaper and more efficient LED, Kilosaver took the middle ground approach. Fig. 1. Kilosaver T8 LED Tubes can be simply connected to one end. Simplifies connection and reduce installation cost and component costs. If you inserted wrongly, there will be no light but also no power trip and no electrical damage; you just flip it over. The Active Side is indicated on the tube with the label. If you are using electronic ballast, you have to remove the electronic ballast and use Fig. 1 connection as shown. Fig. 2. For those with existing fluorescent tube and don't wish to remove them, you just need to replace the Fluorescent Started with the provided LED Starter. The LED Starter is just a short circuit. Just in case you don't have it and needs to improvise, just open up the fluorescent starter and wire a short across the leads. Please get advise from an electrician if you are unfamiliar. The tube can be inserted in any direction and polarity. If possible, simplify your connection to Fig. 1. shown above. That will save some energy loss in ballast. If you are using electronic ballast, you have to remove the electronic ballast and use Fig. 1 connection. Fig. 3. This is a typical circuit for a traditional fluorescent tube. Fig. 4. We do not recommend this type of LED. 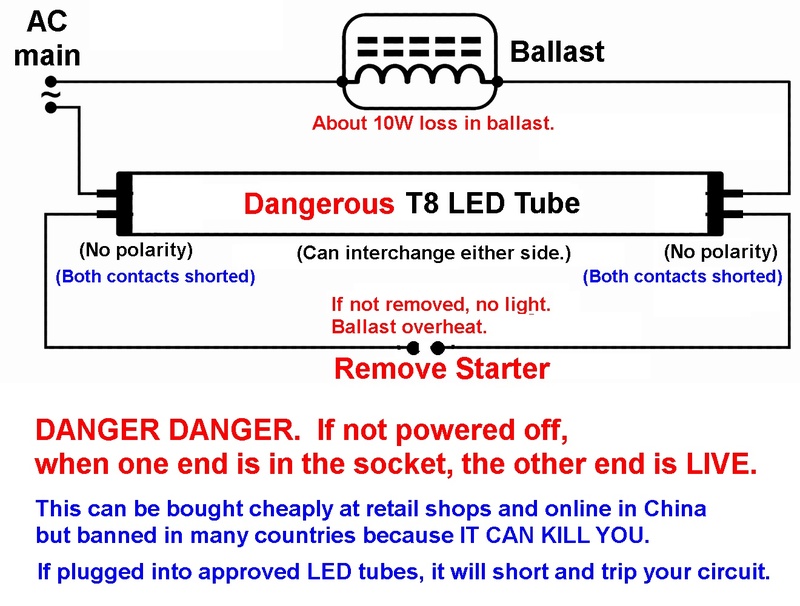 If the vendor says that you just need to remove the starter, then your LED tube must be of this DANGEROUS type. The current flows from one end of the tube to the other end. Normally, people leave the power on so they will know if the light works without having to climb down the ladder to switch it on. If you happen to touch the other end, you will get a nasty shock and can kill. People had fallen off ladders from the shock and badly injured. Fig. 5. Some other brands use a simple fuse. Therefore energy is lost from current passing through the ballast. Without a capacitor, energy cannot be recovered and it's lost. Lost energy turns into heat and you need 4 times the energy for the aircon to remove it. Therefore, your lost is not just 10W, your loss is 50W if your room is air-conditioned. Fig. 6. Normally, people who want to save energy will connect it the simple way shown above. This is similar in connection to the Kilosaver shown in Fig. 1 but with a slight difference. If the Active Side and Dummy Side are swapped, the fuse will blow, causing a power trip. A power trip can damage equipment and cause computer data loss. Once the fuse is blown, you can never connect it back as in Fig. 5. You can still use it as in Fig. 6. However, as seen in Fig. 1, Kilosaver LED tubes will not trip because the capacitor provides a high impedance instead of shorting your circuit. If you are using electronic ballast, you have to remove the electronic ballast and use Fig. 6 or Fig. 1 connection as shown.